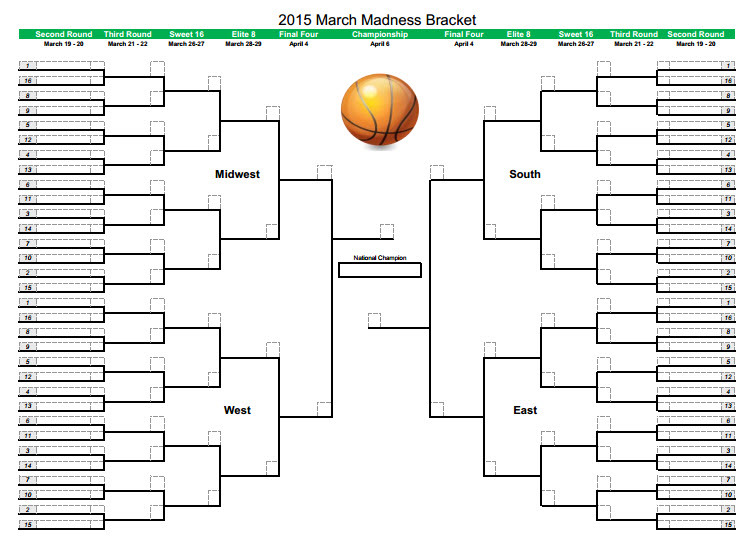 PrinterFriend.ly brings you what no one else does – printable March Madness brackets 2015. Check out our offered printable brackets today to pick the best one. Get your bracket printed and enjoy the game with us. The 2015 March Madness Bracket kicks off with the First Four scheduled to occur on March 17th and 18th, 2015. The First Four is scheduled to take place in Dayton, Ohio again this year at the University of Dayton. Once the First Four is over, the second round of the NCAA Tournament kicks off on March 19th, 2015. The third round of the 2015 edition of March Madness will kick off on March 21st, and the Sweet Sixteen will get started on March 26th, 2015. The 2015 NCAA Men’s Basketball Tournament Final Four will be held on April 4th, 2015 and the championship game is scheduled to take place on April 6th, 2015. The following is the schedule and printable 2015 March Madness Bracket and will be updated as we get closed to the 2015 NCAA Selection Sunday Broadcast. 2013 Louisville (35-5) Rick Pitino 82-76 Michigan Atlanta Ga.
2012 Kentucky (38-2) John Calipari 67-59 Kansas New Orleans La. 2010 Duke (35-5) Mike Krzyzewski 61-59 Butler Indianapolis Ind. 2009 North Carolina (34-4) Roy Williams 89-72 Michigan State Detroit Mich.
2007 Florida (35-5) Billy Donovan 84-75 Ohio State Atlanta Ga.
2006 Florida (33-6) Billy Donovan 73-57 UCLA Indianapolis Ind. 2005 North Carolina (33-4) Roy Williams 75-70 Illinois St. Louis Mo. 2003 Syracuse (30-5) Jim Boeheim 81-78 Kansas New Orleans La. 2002 Maryland (32-4) Gary Williams 64-52 Indiana Atlanta Ga.
2001 Duke (35-4) Mike Krzyzewski 82-72 Arizona Minneapolis Minn.
2000 Michigan State (32-7) Tom Izzo 89-76 Florida Indianapolis Ind. 1999 Connecticut (34-2) Jim Calhoun 77-74 Duke St. Petersburg Fla.
1997 Arizona (25-9) Lute Olson 84-79 (OT) Kentucky Indianapolis Ind. 1996 Kentucky (34-2) Rick Pitino 76-67 Syraucse East Rutherford N.J.
1995 UCLA (31-2) Jim Harrick 89-78 Arkansas Seattle Wash.
1994 Arkansas (31-3) Nolan Richardson 76-72 Duke Charlotte N.C.
1993 North Carolina (34-4) Dean Smith 77-71 Michigan New Orleans La. 1992 Duke (34-2) Mike Krzyzewski 71-51 Michigan Minneapolis Minn.
1991 Duke (32-7) Mike Krzyzewski 72-65 Kansas Indianapolis Ind. 1990 UNLV (35-5) Jerry Tarkanian 103-73 Duke Denver Colo.
1989 Michigan (30-7) Steve Fisher 80-79 (OT) Seton Hall Seattle Wash.
1988 Kansas (27-11) Larry Brown 83-79 Oklahoma Kansas City Mo. 1987 Indiana (30-4) Bob Knight 74-73 Syracuse New Orleans La. 1984 Georgetown (34-3) John Thompson 84-75 Houston Seattle Wash.
Who are the Favorites for the 2015 Edition of March Madness? The 2014 NCAA Men’s Basketball tournament was one of the most exciting editions of March Madness in recent history. 2015 is shaping up to be equally exciting as there are a number of players returning from this past season who were previously forecasted to go pro after one or two years of playing college basketball. Most notable are the Kentucky Wildcats who lost to the Connecticut Huskies in the 2014 NCAA Tournament Championship game. The John Calipari-led Cats are returning a number of star players from last season to include the Harrison Twins which is making them the odds-on favorites to win the 2015 NCAA Men’s Basketball tournament. Other teams to watch for the 2015 NCAA Tournament include the North Carolina Tar Heels, Louisville Cardinals, Michigan State, and the Villanova Wildcats. Of course fans wonder who will be the 2015 edition of Wichita State for this year’s March Madness! In order to help NCAA fans enjoy both forecasting and tracking the 2015 NCAA Men’s basketball tournament bracket, we have provided a printable 2015 March Madness Bracket for you to enjoy for free! Download, view, and print out your 2015 March Madness bracket at PrinterFriend.ly.